(Hebrews 9:28 NKJV) so Christ was offered once to bear the sins of many. To those who eagerly wait for Him He will appear a second time, apart from sin, for salvation. (1 John 2:2 NKJV) And He Himself is the propitiation for our sins, and not for ours only but also for the whole world. (Isaiah 53:11 NKJV) He shall see the labor of His soul, and be satisfied. By His knowledge My righteous Servant shall justify many, For He shall bear their iniquities. We’ve been hearing a lot from our local pastor lately about how heresies like the above so greatly diminish what Jesus Christ is and what He did for us. How Yehawweh Elohim can be One Being, yet more than One Person, may be a mystery (although not an insuperable or an unrevealed one), but it is a stated biblical fact nevertheless. Those who maintain Jesus Christ was a created being have to get around more than who He died for; they have to ignore what He was, is and ever shall be as stated in equally plain words. And is not that stumbling block what motivated Arianism in the first place: how God can be One, yet more than One? Doctrines become a lot more complicated when you ignore plain statements in the Bible. John 1 completely debunks Christ being created and also plainly states He created us. I just read through Romans 5:15-21 the other day, so this topic is fairly fresh on my mind. When I imagine Adam first sinning, or Christ being the first to overcome Satan and sin, I think of untamed jungle foliage being cut down by someone with a machete and creating a path for others to follow. As more and more people follow down that path, the plants and trees get stomped down, then the path is widened for many more to walk down with ease. After a while, no one can imagine walking anywhere else. 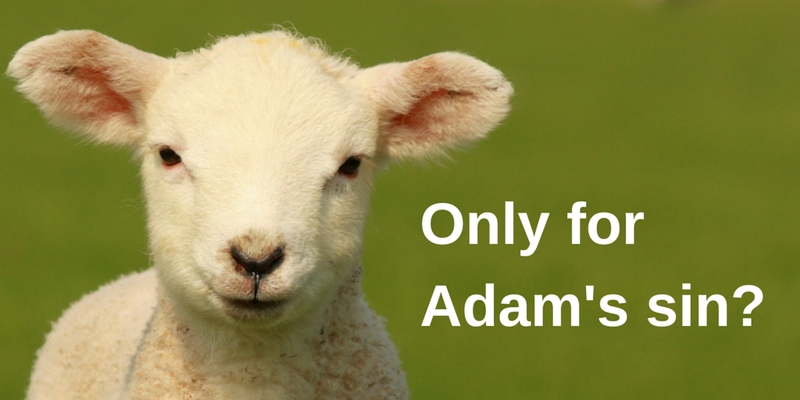 In Adam’s case, all of humanity follows in the ever-widening path created by our human forefather (which is now a super-freeway with 15 lanes of traffic and plenty of convenience stores along the way). In Christ’s case, only a few of us are given the opportunity to follow in His footsteps in the path He created with his life, sacrifice and resurrection — at least at this point in time. But soon, it’ll be the highway people will follow! Another thing that stands out to me in this same passage — on top of what you point out above — is how much more powerful goodness and righteousness are than sin and evil. Or as John 1:5 states: “And the light shines in the darkness, and the darkness did not comprehend [or overcome] it.” James 5:20 speaks in a similar way: “…he who turns a sinner from the error of his way will save a soul from death and cover a multitude of sins.” This concept is repeated in Proverbs, as well. Thanks, all. And, Mike, that seems like good stuff. I like that “hacking through the jungle” analogy.